Synthetic peptide within Human Myosin light chain kinase/MLCK aa 1850-1950 (C terminal). The exact sequence is proprietary. Previously labeled as Myosin light chain kinase. Our Abpromise guarantee covers the use of ab76092 in the following tested applications. WB 1/5000 - 1/10000. Predicted molecular weight: 211 kDa. IHC-P 1/100 - 1/250. Perform heat mediated antigen retrieval via the pressure cooker method before commencing with IHC staining protocol. Use of HRP-conjugated or polymerized HRP secondary antibodies, stronger signals have been found using the polymerized HRP secondary. 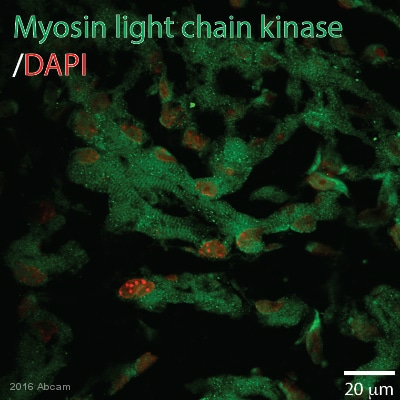 Calcium/calmodulin-dependent enzyme implicated in smooth muscle contraction via phosphorylation of myosin light chains (MLC). Also regulates actin-myosin interaction through a non-kinase activty (By similarity). Implicated in the regulation of endothelial as well as vascular permeability. 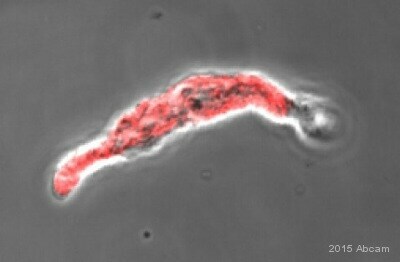 In the nervous system it has been shown to control the growth initiation of astrocytic processes in culture and to participate in transmitter release at synapses formed between cultured sympathetic ganglion cells. Critical participant in signaling sequences that result in fibroblast apoptosis. Smooth muscle and non-muscle isozymes are expressed in a wide variety of adult and fetal tissues and in cultured endothelium with qualitative expression appearing to be neither tissue- nor development-specific. Non-muscle isoform 2 is the dominant splice variant expressed in various tissues. Telokin has been found in a wide variety of adult and fetal tissues. Contains 9 Ig-like C2-type (immunoglobulin-like) domains. MLCK is probably down-regulated by phosphorylation. The C-terminus is deglutamylated by AGTPBP1/ CCP1, AGBL1/CCP4 and AGBL4/CCP6, leading to the formation of Myosin light chain kinase, smooth muscle, deglutamylated form. The consequences of C-terminal deglutamylation are unknown. 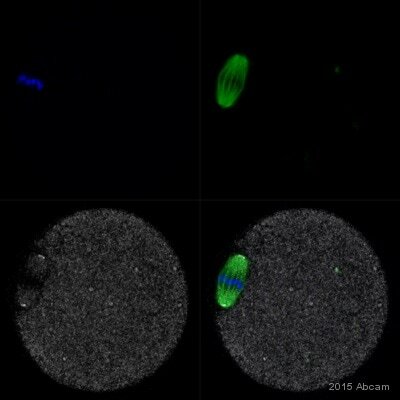 ab76092 staining Myosin light chain kinase/MLCK in mouse oocyte cell by ICC/IF (Immunocytochemistry/immunofluorescence). Cells were fixed with paraformaldehyde, permeabilized with 0.1% Triton X-100 overnight at 4°C and blocked with 3% BSA for 12 hours at 4°C. Samples were incubated with primary antibody (1/50) for 12 hours at 4°C. 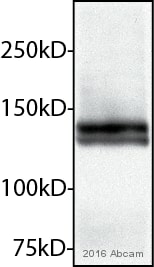 A Cy5®-conjugated goat anti-rabbit IgG polyclonal (1/200) was used as the secondary antibody. 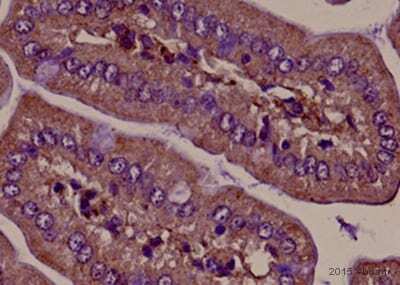 Immunohistochemical analysis of paraffin embedded human smooth muscle, using ab76092, at 1/100 dilution. Publishing research using ab76092? Please let us know so that we can cite the reference in this datasheet.